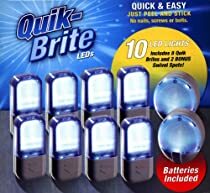 Quik Brite LED lights are task lights where and when you need them. They are one of the leading brands of this new non-bulb based home lighting shift. - installes cleanly, no need for screws or nails and power tools in those awkward places you can't reach. - adjustable lens adjusts beam between 30-60 degrees of angle -- use narrow angle as spot and wide angle as flood light -- but DON't expect it to be a too bright spot. For that use these bright LED spotlights. Mount adhesives strips need replacement when you move the product around - and you WILL. -- Buy extra stick mount strips (from your local home improvement) and place it in a drawer with a quik brite. That way you won't forget where you placed it. Best of all, you can find it in the dark, when you most need them: -- power outage time! The light sensors operate a magnetic relay switch, so make sure the magnet is not loose and stays close to the battery. Read fineprint and maintain batteries, -- or keep replacement ones handy. Battery, 3 per light piece, AG13 = also known as LR44, A76, 375A. AG5 = SR48, 393, 93, 398A, LR48 button cells. Check first to be sure. Don't forget replacement batteries -- get large enough pack, these task lights can go anywhere!